Many users would like to know what is happening, as we all feel that we are being lied to and then not being told where to go or whats happening. we were promised 3 years ago that an update was coming, yet nothing ever happened. 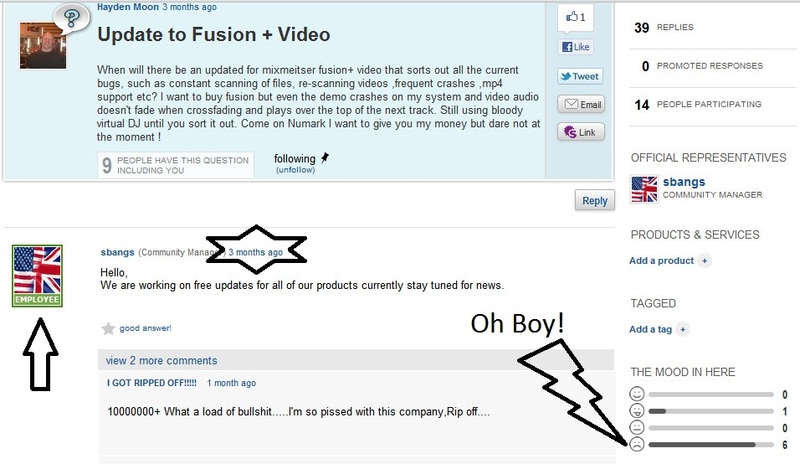 i personally asked via twitter to what was happening about 6 months ago and even asked for some videos of the software showing the video side of the software being demod to show the customer whats its like and was met with "there should be somethign there hang on ill look" then i was met with silence and then an email from mixmeister saying sorry for the delay they suddenly just realzed an update hadnt been worked on and now the new community is up. so its taken 3 years to figure that they need to do the update even after stating an update was coming, and now we are being fed stories and told to go to their community to talk about it all, where it apparantly should have been here in the first place. My friend has this software and I've been trying to help him get it to work (mainly because I am interested in purchasing it myself). I am impressed by the software on so many levels....but alas, we can't all go back to Windows XP when it worked. We'd like to voice our concerns here and see if NUMARK or MIXMEISTER employees would like to chime in on what in the world is going on with software updates. Appreciate your timely response. My friend has this software and I've been trying to help him get it to work (mainly because I am interested in purchasing it myself). I am impressed by the software on so many levels....but alas, we can't all go back to Windows XP when it worked. We'd like to voice our concerns here and see if NUMARK or MIXMEISTER employees would like to chime in on what in the world is going on with software updates. Appreciate your timely response. wow this just shows how much the companies give a rats behind about their future and currently consumers of the product when over 2 weeks go by with non of their staff responding.